Black Boxes In Cars? - Cars! Cars! Cars! The module, part of the air bag sensing system, stores information in the few seconds before a car sensor identifies a crash and fires the air bags. The data includes the speed of the car, whether the driver was wearing a seat belt, when an air bag deployed and whether the driver used the brakes. GM has quietly installed different versions of the sensing system on some cars throughout the 1990s, but the modules have become more sophisticated over time. Their existence became public in a paper written by GM and government engineers and presented at a conference last month. Our take on the matter? Black boxes are a good idea. Driving is a privilege, not a right. But there has to be rules that we all know, however, before agreeing* to have these in our cars. * 1. We can't agree to something if we don't know it's there. Any manufacturer that installs devices in a vehicle which collects data on how we use that vehicle should be totally upfront about the devices being installed. (i.e. has purchaser sign a waiver saying a data collection device is installed). 2. Usage: We should all know what data is being collected. Under what circumstances can the data be retrieved? What could the data be used for? 3. Are there penalties for disabling it? Since it's my car and I can take the stereo out (or shove a peanut butter & jelly sandwich into its CD slot) or turn off the passenger air bag or let gunk get into my windshield washer nozzle, am I obligated to make sure my data collection device is operating at all times? Is there a fine for failure to maintain it? What about removing it? Can I even remove it? It's my car! Driving is not a privilege, it's a right. Saying it's a privilege is the most arrogant thing I have ever heard. Those government roads and highways wouldn't even have been built if it weren't for taxes. The people own the roads and it's their right to drive on it. The government doesn't grant us our freedoms, they just enforce what the people decide should be our freedoms. The editors of this site need to educate themselves, or get out in the real world and get a real job. Hey, I don't care if they use this data to deturmine what happened during a crash, but they better not even think of putting one in to record our driving habets. The ones they currently use only record 5 seconds before a crash and could be useful to deturmine the cause of an accident. The government is trying to record our every move. They have already put thousands of camaras out to take pictures of us everywhere we go, yet they can hardly put a few cameras on our boarders. The governer of California ,Arnald Schwarzenegger, has even proposed using satilite tracking and transponders on vehicals. This would give the government your every move from rush hour highway to the country two lane road. We CAN NOT let this happen. Schwarzenegger is now trying to ammend the constitution to allow him, a foriner, to run for president. Do the research and wake up America. The vote is yours but you must know the truth. Our government is very corrupt and the media is not helping at all. They have been lieing to you. Don't let the USA fall apart. Also WATCH THE DOCUMENTRY BY ALEX JONES ABOUT 9/11 ON GOOGLE VIDEO. It made me very angry at first because it was against Bush but I soon began to realize the TRUTH OF OUR GOVERNMENT and the coverup of 9/11. 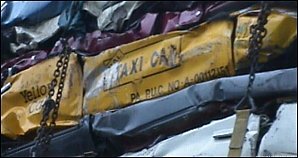 Putting black boxes in the cars is one of the great ideas as long as safety is concerned. due to the black boxes we atleast come to know the reasons for accidents and is easy for investigation of the mishap. maybe its ok to store info for crash investigation, that has helped somewhat in aircraft accidents .it has the ability to make vehicles safer but they are pretty safe now.some people just can,t drive.teach us all to drive not just get a license to drive and then see what happens,the roads might get safer.increase every drivers skill level and check it regularly.if you think about it most driving tests are pretty well useless.its more to do with being allowed to drive that actually being good at it. not everyone can become a f1 driver but the training they get would make most drivers better.as authorities around the world use road safety as a cash cow by forcing us to think speed is the main area of concern and fining the hell out of us , then the problem will never go away.it quite frankly is a very complex issue and really humans are the most significant factor involved.encouragement to become a better driver could change the nature of the very driving habits that cause the most risk on the road. our authorities , as it would seem ,place so many resources towards lowering the road toll when in fact they have most probably been the root cause of it.the appalling skill level of the worlds drivers must really be put in perspective.some people will never be able to co ordinate themselves ably enough to operate an kind of machinery but the majority of the population could be taught far more skilfully than at present.then the question is how much will it all cost .every road death has a figure associated with it ,what price do we pay for life .millions go into cancer research trillions to war ,so i can really see the argument.we spend more to try and kill healthy people than actually trying to save them .time to adjust the balance.